Conflict is inevitable in relationships, with teams, at work, and in life. My guest today is an expert in compassionate leadership and conflict resolution. Nate Regier is an author, speaker, psychologist, and the CEO of a consulting company called Next Element. He shares with us how his unique upbringing shaped his view of compassion and drove him to develop a methodology to better solve conflict without casualties. 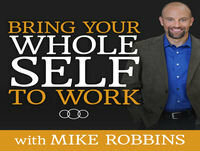 He explains what the compassion cycle is and how we can resolve even the most difficult conflicts at work and at home. And, when we do this, our teams. [4:54] Nate’s family did missionary work in Africa, which led to him living there and attending an ambassador school that represented 35 nationalities. He knows firsthand what it is like to exist in a culture with different perspectives and languages. [7:40] Nate has had to reconcile the two driving forces inside him of being both very competitive and goal-oriented versus the ethnic setting of pacificism and peace. [13:43] Nate and his team started Next Element when they saw a great need for a model that encouraged mental health mixed with productivity in the workplace. [16:45] We often think that conflict needs to be managed, mediated, or reduced when it is simply just a gap between what we want and what we are experiencing. It is neither good or bad, but the gap takes on energy depending on how we assign and label it. At Next Element, Nate and his team look at what people do with the energy, and the psychological behavioral dynamic behind the gap. [18:04] Conflict becomes destructive when we bring our need to be justified in, along with the conditions of being okay that we put on each other. [24:04] It’s the uncomfortable conversations inside the room that get messy, but these are also the ones that truly address and solve conflict. [25:49] A compassion cycle is made up of three core skills that people can learn to apply and manifest compassion: openness, resourcefulness, and persistence. [27:37] A common conflict in the workplace is unmet expectations. When the team has developed a safe environment, they can begin to be curious about what is at stake, how both parties are feeling, and the true emotions attached to the situation. [43:12] Nate’s new book, Seeing People Through is about looking through the lens of dealing with individual differences in an authentic manner. [44:58] LinkedIn is one example of a company Nate feels is doing it right in the area of team development and conflict resolution. Conflict without Casualties: A Field Guide for Leading with Compassionate Accountability, by Nate Regier, Ph.D.